I often see benchmark reports that show charts but don’t provide tables of numeric results. Some people will make the actual measurements available if asked, but I’ve been interested in analyzing many systems for which I can’t get numbers. Fortunately, it’s usually possible to get approximate results without too much trouble. In this blog post I’ll show several ways to extract estimates of values from a chart image. I’ll motivate the idea with a simple chart of a slide I saw at the recent PGConfSV conference on a keynote presentation. I was interested in the benchmark data (for CitusDB, in this case) but I am sure they are busy and I haven’t gotten in touch with them yet about it. So I watched the YouTube video of the keynote address, paused it when the slide was showing, and took a screenshot. 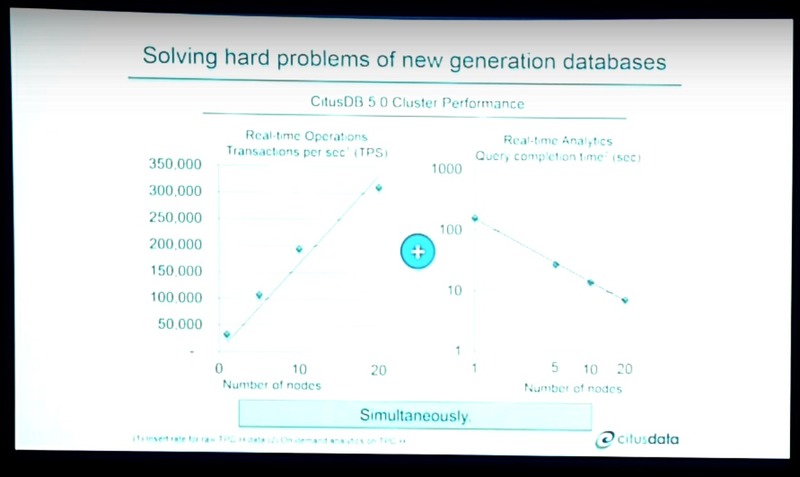 I’d like to use the Universal Scalability Law to analyze the chart on the left and estimate how much of CitusDB’s massively parallel processing is serialized. I am not an expert on it, but I believe it uses a PostgreSQL node with a plugin as a query planner and router, sends queries to shards containing data, and combines the results to return them to the client. This is fairly standard scatter-gather processing. One of the big limiting factors for such a system is typically the query planning and the merging of the results. How much of the overall execution time does that take? The Universal Scalability Law can help understand that. But to analyze the system, first I need its data. Let’s see how to get it. I’m going to show you two hard ways to do this and suggest a couple of easier ways. One nice thing about this method is that you can then combine the image with any graphs you’re making. For example, I used this method to facetiously analyze the path of the eclipsing moon on a recent blog post. Why use hard methods like that? I believe the hard ways are still valuable to know about. First of all, when you do it you get a firm grasp on the math and you’re tuned in to what you’re working on (or I am, at least). Second, sometimes when charts are skewed by, say, the camera’s perspective, you have to estimate where the points would fall if the skew were corrected. Of course, the X-points should be set to 1, 5, 10, and 20 as before. That was easy! Easier than using RStudio, perhaps. 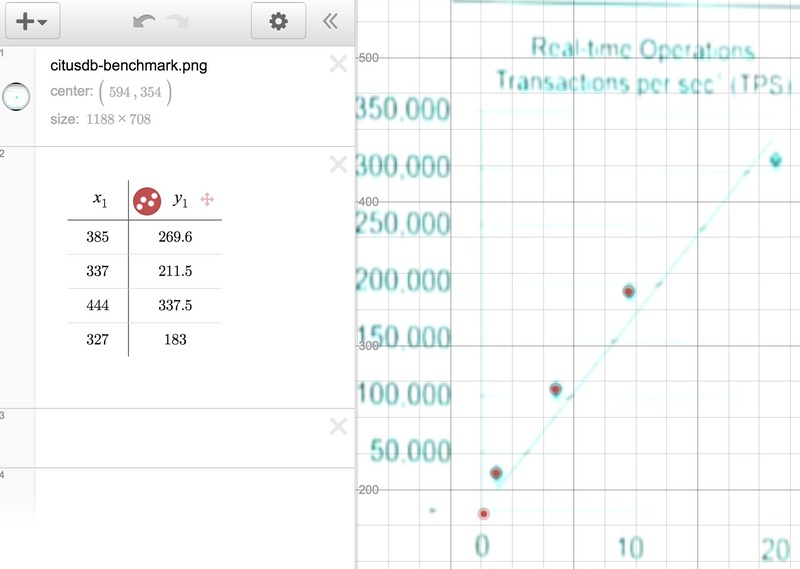 Using the techniques I showed in this article you can extract graph points from a variety of different images when you lack the source data. Some of these techniques are easier to use on large datasets than others, and some are just more fun if you feel like doing things manually, but all can produce results good enough for many purposes. Photo by Scott Schiller on Flickr.